The Electric Bullet takes the Management Committee to Edinburgh! I attended the event with my colleague and our Group Secretary, Coral Bell. The event introduced SDGs to Coral and re-engaged me with the framework they offer in bringing climate change, sustainability and low carbon futures into the mainstream. We arrived in sustainable style by electric car, pulling into the City Chambers forecourt and plugging-in to park and charge during the conference. We’d not been to this venue before and we were both so impressed with the centrality of the venue for an event, including a fabulous downtown parking location for the electric car. During my studies at Dundee University, SDGs were not dealt with directly which on reflection seems a bit ironic. In looking at the bigger academic picture, I’d lost sight that SDGs are key in representing 17 areas of the three pillars of sustainable development: planet, people, profit. However, the 17 goals were omnipresent, just not highlighted as a concept. I seem to remember that initially SDGs were an educational tool for developing countries to promote awareness in climate change. More recently we recognised them as valuable learning framework at home in Scotland and other developed countries. The event reminded me about that, and inspired Coral and I to look at how we can embed them more effectively in our community work. This comes with a specific focus within the Carse of Gowrie Sustainability Group’s junior division, the Junior Carsonians (JC’s) who represent the six Carse Primary Schools, about 1000 children. The JC’s meet regularly to work collectively on climate change projects, often taking the work back to their own schools to be further developed. All the presentations at the event were great in sharing ideas and projects that are happening across Scotland. Email, twitter and facebook are all well and good but having the chance to sit, talk and debate with a diverse group of people for a few hours can just have great impact. As Coral and I love a ‘bit of a debate’ we thoroughly enjoyed the group discussions which had a good amount of time was allocated. I’d just like to say thank you to the organisers and everyone’s generosity in sharing their experiences and expertise. So a friend asked 'Can someone just pull out your cable when you are charging in the street'? When you get your electric car you apply for your 'charge your car' card which is a 'fob' really (it's a £20 once in a lifetime payment). You present it to the electrical charge point, it verifies you and you are able to plug your cable in. This locks both ends of the cable into the charge point and your car respectively os it can't be pulled out. The only way it can be removed is when a) you have represented your card to stop the charge and b) your vehicle is unlocked. 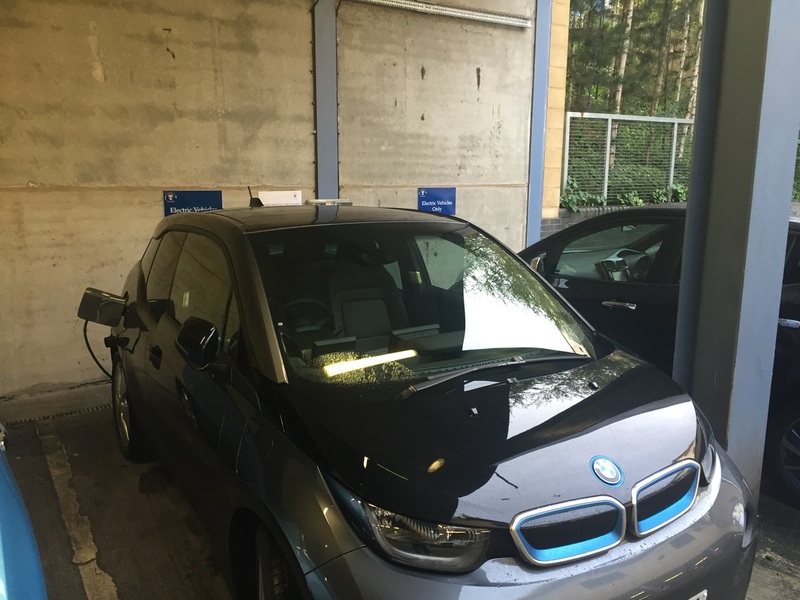 The Scottish Government provide a grant of £5k or a 0% loan of up to £35,000 (over six years) when purchasing a new electric car and home charger units! After 3 months with the i3 BMW electric car which has a 7 litre emergency petrol tank - I just filled up! £7.56 of petrol in 3 months (van would have been £600 in fuel). It's an approximate saving of £250 a month versus petrol/diesel in terms of tax, parking, fuel & free plug-in street charging. I regularly drive to Dundee which is way ahead of other Scottish cities in terms of the number of street and car park plug-ins in the city centre. Perth only has plug-ins on the edge of the city and provides no free plug-in & parking like Dundee. Edinburgh has NO street plug-ins and not one of the central car parks has an electrical plug-in facility - the nearest is at the university a mile or so from Princes Street. The Raddison Blue on the Royal Mile has chargers in there car park for £24 for 0-24 hours parking & charge.